When I started playing guitar, I was predominantly a metal head. My axe was the trusty Peavey Destiny which I’d won in a raffle (check out the story here.) 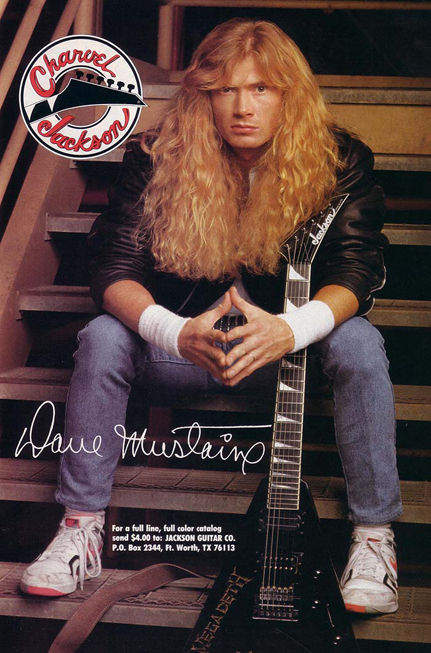 but the guitar I really wanted, the one that I needed to fulfill my destiny as supreme heavy metal overlord of the small township that was Griffith, NSW… was a Jackson V. I was obsessed with Megadeth at the time, and they were the weapon of choice of Dave Mustaine, so that was good enough for me. 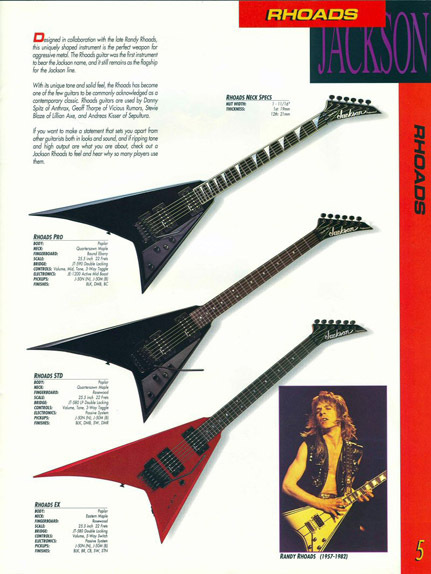 The Jackson model that I specifically wanted was the Randy Rhoads V. The Jackson Rhoads was developed by Randy Rhoads and Grover Jackson and basically… in my opinion… is the epitome of heavy metal guitar design. There isn’t a cooler metal guitar out there to this day, really. And this is pretty amazing for a guitar designed in 1980-81. The whole package… the Jackson headstock, the offset V shape, the points, the sharkfin inlays… and then later on, the inclusion of the Floyd Rose made this guitar pretty much unbeatable. Now, my Peavey was a more than capable guitar for me to fulfill my metal calling, but it wasn’t a Jackson V. Around this time, Jackson released the Professional series Rhoads V, which was a bolt on version with a rosewood fretboard and no shark tooth inlays. My mate Anthony ordered one in for his guitar store, and this was my first ever chance to actually hold a Jackson V in real life. 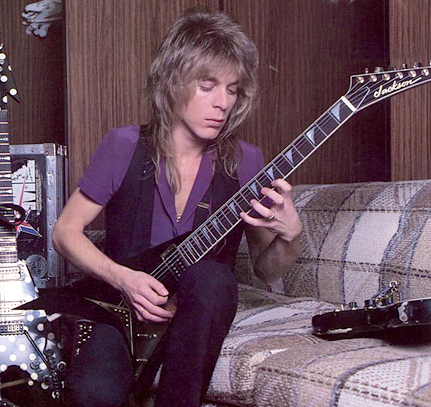 While is played beautifully and sounded great… it wasn’t a ‘proper’ Jackson Rhoads. It needed to be neck through… it needed shark tooth inlays… it needed an ebony fretboard. I bit the bullet and traded in my red Peavey and got Anthony to order a Jackson Rhoads Pro… which was the top of the line Japanese model. Anthony was having a hard time finding me one. Finally, after a few weeks of searching he managed to track down a NOS Rhoads Pro that was found in storage in some music shop’s back room, due to the fact that it had a small dent in the finish. It wasn’t black like I wanted… it was dark metallic gun-metal grey, but what the hell… I needed that guitar… and this was the last one in Australia, so I couldn’t be too picky. When it arrived, me, Anthony & my band mate Christian crowded around the HUUUUGE guitar case and opened her up. She was absolutely the most beautiful guitar I’d ever seen. THIS was a heavy metal guitar. Not some cheap bolt on version. THIS.WAS.METAL. The sharkfin inlays were beautiful… real abalone, no mother of toilet seat. 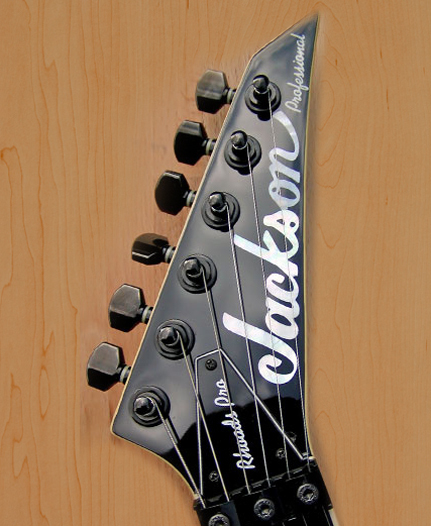 As was the inlaid Jackson logo on the headstock, which was usually reserved for some custom shop USA Jacksons. This guitar was class, top to bottom. The thing that struck me most about the guitar was how solid it felt. The neck wasn’t a thin tooth pick or huge log… it was somewhere in between… sort of like a 60′s Les Paul neck. The other thing that struck me was how wiiiiiide the neck was. My Peavey Destiny was quite narrow at the nut… the Rhoads was a lot different. It took a little while to get used to it as I have small hands. Anyway, first order of business was to put the Rhoads to work recording our 2 song demo… on hi-tech 8 track cassette tape. As you can see, I’m quite stoked to own such a metal icon. Over the next few years, my Rhoads was my main axe. 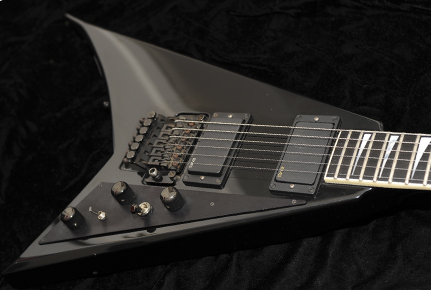 The only adjustment I made was to switch the active Jackson pickups to Bill Lawrence Blades humbuckers as the USA Jackson Rhoads models had started sporting these and they also were the preferred choice of Dimebag Darrell. Plus, I never was really happy with the standard pickups… to tell the truth, my Fernandes Polka Dot V killed the Jackson for out and out tone. My Rhoads was my live guitar, but my PDV was my preferred recording guitar. Even after the pickup change, the PDV still sounded bigger and warmer. The Jackson was very cutting and razor sharp… perfect for lead but not so great for rhythm. Fast forward to 1995 and I was starting to listen to other music apart from metal. I actually was purposefully NOT listening to metal, as it had been all I’d listened to for the last 8 years and I needed a break. Heavy metal is an all consuming lifestyle… you’re either in or you’re out. It was time for me to get out and see what else the world had to offer. I was listening to Kyuss, Helmet, RATM, Alice In Chains… basically, bands that didn’t play Jackson V’s. So I packed my Jackson away and didn’t play it for over a year and starting playing my #1 Squier Strat again, as I was getting into Fenders again, probably due to the grunge movement. It was around this time that Fender Australia started importing the excellent Fender Japan line. One guitar in particular caught my eye… the new ’69 Thinline Telecaster. I loved the look of it, so I brought the Jackson into Custom Music to sell on consignment. There she hung in the shop… waiting for her new owner. One day, some metalhead wannabe picked her up and dropped her, taking a HUGE chunk of paint off the bottom corner. Anthony was furious and called me. He said he could fix it… I didn’t really care, just as long as I got my Thinline Tele. Afterwards, this saddened me a little… this was a guitar that I had lusted over, that I had wanted so much… and now I couldn’t care if I didn’t see her again. I realise now that I wanted to make a clean break, so I couldn’t afford to care. This guitar held a lot of memories for me… a lot of metal shows with other cool bands and a lot of band practices and recording sessions with my best mates. Now it was time for me to move on and try new things and this guitar couldn’t be a part of that. After all… this guitar WAS heavy metal. Over the last few years, I’ve gotten back into heavy metal and I realise that I’ve missed this guitar a lot… or more specifically, the memories it represents. 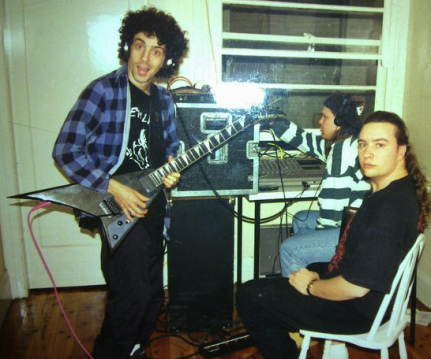 The years in my metal band were some of the best ever… we had some pretty good times. Long live Longbongtonx. I’m not crying I have dust in my eye…..
It’s a good thing that I bought a white RR neck thru. 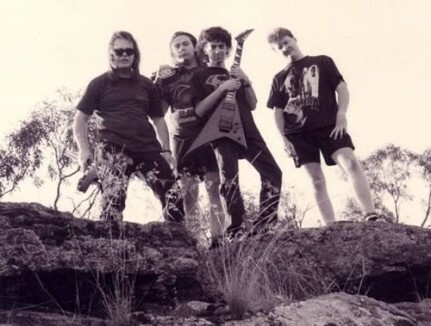 Hey tony, I was wanting to get your thoughts on a charvel by Jackson model 4 that’s popped up locally on gumtree. I’m not a metal guitarist but have a soft spot for 80s Japanese metal shapes in guitars. Anything I should be looking out for in particular?